This tape measure and has a magnetic pickup feature at the end. 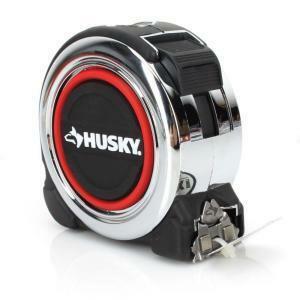 The specific tape measure that I use is the Husky 30′ tape measure with a magnetic tip. Lowes has a similar tape measure made by Kobalt, and the May issue of The Journal of Light Construction had a full page ad featuring a new magnetic tip tape measure from Stanley. I wonder what took Stanley so long to come out with one of these? I’ve been using this same tape measure for about two years with no problems. If you know of a better tape measure, let me know about it.